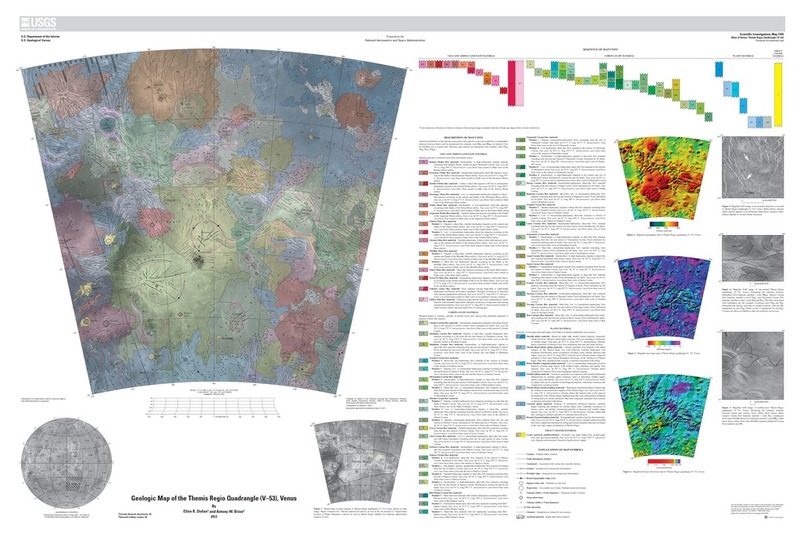 The Themis Regio quadrangle (V-53), Venus, has been geologically mapped at 1:5,000,000 scale as part of the NASA Planetary Geologic Mapping Program. The quadrangle extends from lat 25° to 50° S. and from long 270° to 300° E. and encompasses the Themis Regio highland, the surrounding plains, and the southernmost extension of Parga Chasmata. Themis Regio is a broad regional topographic high with a diameter of about 2,000 km and a height of about 0.5 km that has been interpreted previously as a hotspot underlain by a mantle plume. The Themis rise is dominated by coronae and lies at the terminus of the Parga Chasmata corona chain. Themis Regio is the only one of the three corona-dominated rises that contains significant extensional deformation. Fractures and grabens are much less common than along the rest of Parga Chasmata and are embayed by corona-related flows in places. Rift and corona formation has overlapped in time at Themis Regio.